Patient Guide: Liposuction for Lymphedema - Am I a Candidate? A specialized form of liposuction for lymphedema has been successfully used to treat advanced cases of lymphedema for decades. Despite this success, it remains a poorly understood and uncommon surgical treatment for advanced lymphedema. Lymphedema is a chronic swelling condition characterized by an excessive accumulation of lymph fluid, most often in an arm or leg. Predictably, the treatment of lymphedema focuses on strategies to remove this excess fluid, and prevent further accumulation – such as via compression garments and manual lymphatic drainage massage. Under this paradigm, using liposuction for lymphedema doesn’t appear, on the surface, to make a lot of sense – since it targets fat rather than fluid. In fact, liposuction is generally considered to be both risky and counter-productive in this population; people with lymphedema are discouraged from even getting blood drawn from their afflicted limb for risk of sparking inflammation or infection. But for a subset of lymphedema patients, liposuction can profoundly improve their lives. 1 Liposuction for lymphedema: Is it effective? Is it safe? 1.1 Which patients might be helped by liposuction? 1.2 Is liposuction for lymphedema a cosmetic procedure? 1.3 Is liposuction a cure for advanced stage lymphedema? 2 Are you a good candidate for lymphedema liposuction? 2.3 Liposuction Clinical Decision Tree: Am I a Good Candidate? 3 What does lymphedema liposuction entail? 4 What outcomes might you expect? 5 Where can you have this liposuction procedure performed? Liposuction for lymphedema: Is it effective? Is it safe? Which patients might be helped by liposuction? Liposuction (or “suction-assisted lipectomy”) is a very common cosmetic surgery used to remove fat, not fluid. For cases of lymphedema that are classified as stage 1 – where swelling is predominately comprised of excess lymph fluid, liposuction would not only be ineffective, this invasive procedure would further damage lymphatic and blood vessels, promote inflammation, risk infection, and generally exacerbate symptoms. However, in cases of lymphedema that have progressed to stage 2, we see things begin to change. Swelling gradually becomes more firm, dense, unaffected by elevation, and “non-pitting” – meaning that if you press your thumb into the swelling it will not leave a temporary indent. The pitting test can be used as an indicator that the swelling is no longer primarily lymph fluid, but has instead morphed into significant amounts of fat (adipose tissue) and fibrous scar tissue – physiological changes that occur as a byproduct of prolonged lymph fluid accumulation. (You can learn more about the connection between lymph fluid and adipose here: Untreated Lymphatic Swelling Promotes Weight Gain by Altering Stem Cell Behaviour). By the third stage of lymphedema the swelling has progressed even further, becoming very firm, irreversible, and usually physically debilitating. It is at this stage that the excess limb volume is primarily comprised of adipose tissue (along with a corresponding increase in muscle and bone mass – an adaptive response to the extra mechanical load imposed by the excess fat), rather than fluid (ref 1). For patients who have progressed to stage 3, standard lymphedema treatment practices are no longer able to significantly decrease limb size – but liposuction can. The benefits of compression and manual lymphatic drainage at this stage is primarily limited to removing small amounts of fluid and preventing further swelling. Even if an experimental surgical procedure could repair the underlying lymphatic dysfunction in these patients, they would experience little or no reduction in limb size. It is for this subset of patients with stage 3 disease, that lymphedema liposuction has been shown to be very effective at safely reducing the excess fat – and often with dramatic results. Liposuction for lymphedema is still a relatively uncommon procedure, but the results can be striking. Pioneered by Dr Hakan Brorson (Skane University Hospital, Malmo, Sweden) over 20 years ago, this specialized procedure has been slow to be adopted into clinical practice around the world, despite promising results for both arm and leg lymphedema. For patients whose excess volume is due to adipose tissue, liposuction combined with compression has been shown to remove up to 100% of the excess volume (ref 2) – up to 4L of aspirate in the case of arm lymphedema – and without further impairing lymphatic function (ref 3). Maximum limb size reduction is typically observed by 6 months (ref 4), and with proper on-going post-surgical lymphedema management, recurrence in the long-term appears to be avoidable (ref 4, 5). The best outcomes are seen for patients who are regularly monitored, and who follow best lymphedema management practices including ongoing compression. The pictures below show an example of Dr. Brorson’s work on a patient with stage 3 lymphedema of the right leg. This patient had a very positive outcome from the lymphedema liposuction procedure they received. Figure 1: Example of leg liposuction for secondary lymphedema. Pre-operative (left) and 6-months post-operative (right) pictures show a remarkable decrease in excess leg volume. Images adapted from ref 4. What about for Head and Neck Lymphedema? There have only been a small handful of studies to investigate liposuction for this patient population, and our take is that the jury is still out with respect to how it should be performed, who should receive it, and how effective it might be (see: Liposuction for Head and Neck Lymphedema – Does it Work? For Which Patients?). Our baseline assumption is that if it is delivered in a manner similar to liposuction for arm and leg lymphedema, and on patients with similar characteristics, it should be similarly effective. Is liposuction for lymphedema a cosmetic procedure? Yes and no. It could certainly improve the aesthetics of the limb and associated patient self-image. But it can also help reduce physical impairment, improve patient quality of life, and potentially even partially improve lymphatic function in the limb (more on this below). Is liposuction a cure for advanced stage lymphedema? No. Patients that undergo liposuction for lymphedma still have an underlying lymphatic dysfunction, and so they will still need to manage their condition to prevent swelling and disease progression that got them to stage 3 lymphedema in the first place. That said, when liposuction is performed successfully it can break the vicious cycle of disease progression and offer some patients a life-changing fresh start – the ultimate ‘do-over’. Are you a good candidate for lymphedema liposuction? Liposuction surgery for lymphedema has risks associated with it, significant cost, and significant effort. Its effectiveness and the ultimate satisfaction of the patient will depend on the suitableness of the patient and the skill of the surgical and lymphatic pre- and post-operative team. The below indications and contraindications can help you determine if you are a good candidate, but discussing with your family doctor and lymphedema therapist is necessary to make the best decision for you (as well as to effectively prepare yourself as a candidate). Excess arm or leg volume with no ‘pitting’. Pitting is an indication of excess lymph fluid rather than adipose tissue. Pitting can be evaluated by pressing the thumb very hard into the swelling (as hard as possible) for one minute. If the swelling is due to fluid rather than primarily adipose tissue, this procedure should leave a temporary thumb print, as seen in early stages of lymphedema. The pioneering Swedish group led by Dr. Brorson now accepts patients with very minimal pitting if maximal treatment is unable to further reduce the swelling to a completely non-pitting state (no more than 4-5mm of pitting depth in arm and 6-7 mm in leg). Swelling does not respond to conservative treatment despite maximal effort by a lymphedema therapist trained in combined decongestive therapy (CDT). Once all lymph related swelling is removed from the arm, and no pitting is present, any remaining excess volume can likely be attributed to excess adipose tissue. AND you have considerable functional impairment and/or cosmetic deformity or other complications such as inflammatory attacks or repeat infection (AFTER having excess lymph-fluid removed by combined decongestive therapy). AND You have none of the contraindications below. Patient has NOT undergone maximum conservative treatment pre-operatively. Patient shows ‘pitting’ – which indicates the presence of excess lymph fluid. Patient does not agree to faithfully wear compression garments and follow other best management practices after surgery. Not only is liposuction not a cure for lymphedema, the procedure itself could worsen symptoms if appropriate post-operative care is not taken. In fact, compression and manual lymphatic drainage massage is frequently used after purely cosmetic liposuction as part of the recovery process – to help reduce the swelling and fibrosis liposuction can cause in otherwise normal individuals. In addition to the above, Dr Brorson recommends that patients who smoke cigarettes to stop doing so at least one month prior to the surgery. This will ensure maximal blood supply to the skin (smoking constricts small blood vessels), which can help increase the likelihood of a good outcome. Liposuction Clinical Decision Tree: Am I a Good Candidate? 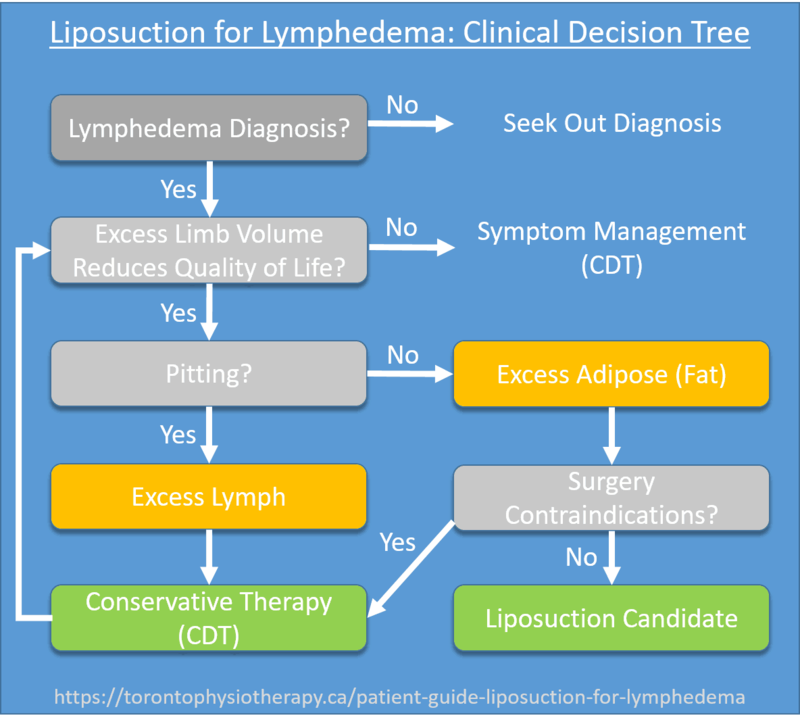 The flow chart below outlines the major clinical decisions that can be used to help determine patient candidacy for lymphedema liposuction. What does lymphedema liposuction entail? Liposuction for lymphedema entails significant cost, risk, and commitment – commitment to finding the right team, undergoing the procedure, and following appropriate life-long best management practices thereafter. This form of minimally invasive liposuction is sometimes called “suction-assisted protein lipectomy”, and it should only be performed by surgeons trained to treat lymphedema, and delivered within a comprehensive lymphedema management program. Liposuction is performed under general anesthetic. Blood is kept out of the limb by use of a tourniquet. The surgeon makes a series of incisions around the circumference of the limb, through which a specialized suction tube (a ‘cannula’) is inserted. These incisions are small and do not require stiches. Suctioning out fat begins at one end of the limb and progresses to the other end, removing as much fat as possible along the way. No liposuction is performed in the hand or foot as these areas do not accumulate lymphedema-related adipose tissue. The overall procedure usually takes a couple of hours, but will require a hospital stay for up to a week. As an essential part of post-operative care, a custom fit compression garment is applied in the operating room to reduce bleeding and post-operative swelling. Hand and foot compression is also applied. Following the procedure, garments are worn continuously 24 hours per day, removing only for bathing and changing the compression garment. (Having more than one garment is important not just to maintain good arm/leg hygiene, but also the act of washing and drying the compression garment will help ‘reactivate’ its compressive properties). Skin should also be moisturized after bathing to prevent drying and decrease risk of infection. Garments are reduced in size or replaced as the swelling subsides to ensure continued effective compression. Even after the maximum amount of swelling reduction has been achieved, patients are recommended to wear their garments as continuously as possible. According to Dr. Brorson, it may take up to 2-3 years before the new arm volume becomes stable, after which reliance on compression garments may potentially be reduced. What outcomes might you expect? Decreased incidence of cellulitis (infection) by as much 75 – 87%, likely in part due to improved blood flow in the skin (ref 5,6). Possibility of a small improvement in lymphatic function as a result of better blood flow, less lymph production (due to less adipose tissue), and less physical compression of lymphatic vessels within the limb, which allows for better lymph flow. However, the patient’s underlying lymphatic impairment remains and so preventing recurrence of lymphedema accumulation requires life-long management. Prevention of reoccurrence of disease progression with appropriate life-long post-surgical management. Where can you have this liposuction procedure performed? Dr. Damstra of Jij Smellinghe hospital Drachten, Netherlands. Dr. Granzow in Torrance, California. Dr. Mackie (trained by Dr. Munnoch) of Macquarie University, Sydney, Australia. Dr. Munnoch of Ninewells Hospital Dundee, Scotland. Johns Hopkins Medicine in Baltimore, Maryland. Dr. Becker in Paris, France. Dr. Campisi in Genova, Italy. This well-known lymphatic microsurgical team also performs their own version of liposuction that includes the use of dyes to help visualize and thus avoid damage to lymphatic vessels (termed “Fibro-Lipo-Lymph-Aspiration with a Lymph Vessel Sparing Procedure [FLLA-LVSP]”. They recently published clinical data demonstrating the results of their approach (ref 8). Dr. Dancey in Birmingham, England. We cannot recommend any particular surgeon or team, nor can we vouch for their qualifications or capabilities. This list is included for information purposes only. If you know of additional specialists who claim to offer liposuction for lymphedema, please comment below and I will include them in this list. As with other surgical procedures, liposuction for lymphedema involves risks, is invasive, and expensive. One article I read quoted prices starting from $8,000 AUD for the procedure at Macquarie University in Australia. If delivered by a trained surgical team in conjunction with ongoing lymphedema management best practices (including wearing compression garments), specialized liposuction for lymphedema can effectively and significantly reduce limb volume in patients with stage 3 primary or secondary lymphedema that is otherwise unresponsive to conservative treatment. Far from being only a ‘cosmetic’ procedure, for some patients liposuction can significantly reduce functional disability and infection (and related hospitalization), while improving limb aesthetics and associated patient self-image. These positive health benefits warrant economic consideration by health insurance providers considering funding this procedure. Happy to provide more information – as someone who researched LE care for many years before exhausting “intensive conservative therapeutic treatment” @ Wittlingertherapiezentrum in Wachsee, Austria, & then research surgical/microsurgical options for my extreme LE (2010-2012), the Campisi approach stood out as THE option. Firsthand consultations conducted at ILF2011, Toronto, bore this out. Forty years of successful experience & expertise was exactly what my case needed. P.S. – as LE&RN: Canada Chapter, Chair, I am somewhat disappointed that your piece was not released during March (“Lymphedema Month”), especially “World Lymphedema Day – 6 March”! I invite you & welcome a visit to my FB page. Cheers! Dr. Davey – thanks for this follow-up, including the added reference plus the info re: the ‘near miss’ of this helpful piece being published during THE month for the Lymphedema Community which, since establishment of “World Lymphedema Day” (6 March 2016), no longer recognizes national boundaries in its fight vs. Lymphedema (LE). While the earlier submitted comment was specific to this appreciated article, this comment offers a more general ‘thank you’ to Toronto Physiotherapy for continuing published research & insights into LE. Please keep up the good (& informative!) work. Hello, Can you advise if Dr. Michel Alain Danimo and Dr. Ali Izadpanah have acquired training for lymphedema liposuction? They are two Plastic Surgeons, part of a Team, at the Centre hospitalier de l’Universite de Montreal; and who are now offering are now offering patients LVA surgery. The first lymphovenous bypass surgery was in January 22, 2018. Both doctors have had training in microsurgery (Dr. Danino in Japan and Dr. Izadpanah in the US). It would interesting to know if also have specific training for liposuction in lymphedema patients. Thank you.